I love finding a raving fan on the internet. Especially, if they rave over New Vintage Church. 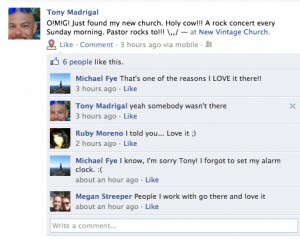 As part of our social media strategy I “Friend” every person who “likes” our church page. I thank them and give them a personal touch. Here’s what one of those people recently said about us after attending for the first time. How do you engage your guests?